Captain Mangino’s obituary notes that a Celebration of Life will be held at Jordan's Restaurant on June 21st, 6247 North 7th Street, Phoenix AZ from 1:00 PM to 3:00 PM. The website for the restaurant is http://jordansmexicanfood.com/ and their phone number is (602) 274-6836. Charles "Ron" Mangino age 78 passed away on Wednesday May 28, 2014 with his family by his side. Ron was born in Phoenix, Arizona on January 12, 1936. He graduated from North High School in 1955 and graduated from ASU in 1959 with a B.S.C. in aeronautics. 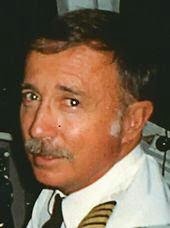 Ron enjoyed a long career in aviation. He began a 33 year career as a pilot flying for Bonanza Airline, Airwest, Hughes Airwest, Republic airlines. He then retired from Northwest Airlines in 1996. Ron was an avid fisherman, skier and golfer. He spent time fishing with friends in Alaska. Ron loved his family, friends and spending time in the White Mountains. Ron is survived by his wife of 50 years, Nancy: his daughters: Rhonda Luobikis, (Scott) Diane Andrews (Mike) and three grand children Katie Andrews, Evan Andrews, and Ethan Luobikis, brother John (Jack) Mangino sister in law Joyce and niece Angela Sierpina, nephews Rob, Chris, and Tim. A Celebration of Life will be held at Jordan's Restaurant, 6247 North 7th Street on June 21 from 1 pm to 3 pm. Contributions may be made to Hospice of the Valley in Ron's Memory.